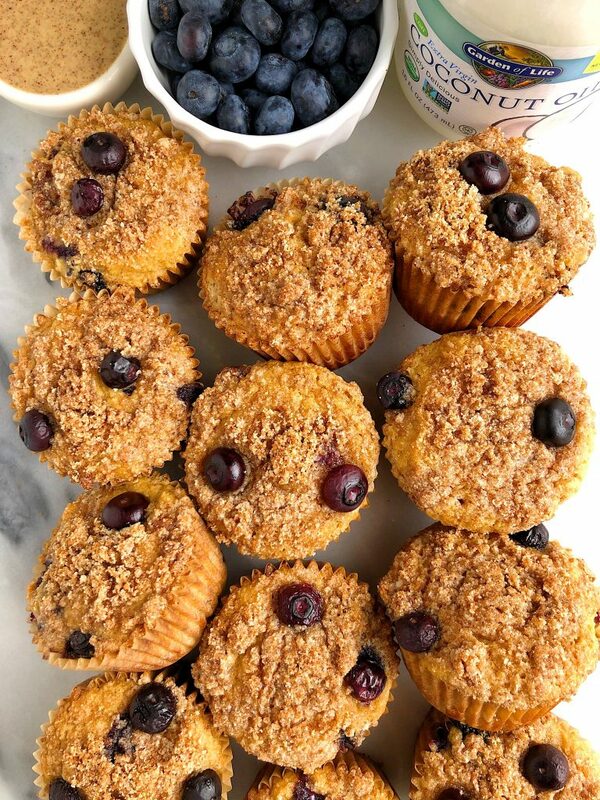 Paleo Blueberry Crumb Cake Muffins made with gluten-free, dairy-free and grain-free ingredients for an easy and healthy crumb cake muffin! Mufffffffins! It has been awhile, I know. Finally sharing a new muffin recipe with you guys. 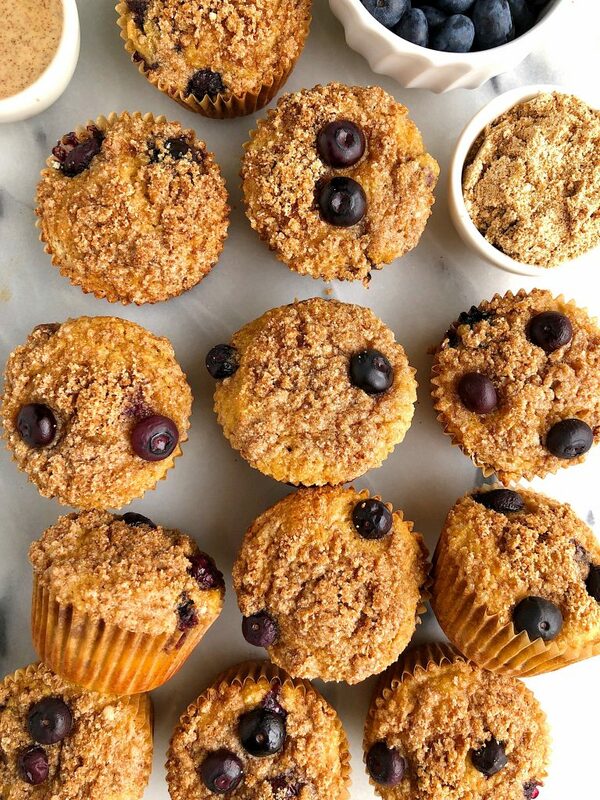 Not sure what has been taking me so long to whip up some new muffins around here but let me tell you that these Paleo Blueberry Crumb Cake Muffins were well worth the wait. They are made with all gluten, grain and dairy-free ingredients and they may just be the easiest crumb cake muffin recipe I have ever made or seen. I use ingredients like pasture-raised eggs, unsweetened applesauce, full-fat coconut milk and almond and tapioca flour in the base of the muffin. The crumb topping though is really my favorite part. I mix together some almond flour, coconut sugar, cinnamon and chilled Garden of Life Organic Extra Virgin Coconut Oil to get that perfectly crumbly topping to add. Using chilled or solidified coconut oil here is key. You guys know my obsession with Garden of Life products and especially their coconut oil! It is a go-to for all my baking and cooking and I keep an extra jar in the bathroom for my skin and hair too. It also melts super easily so any recipes that you need liquid coconut oil for too, you can use it! 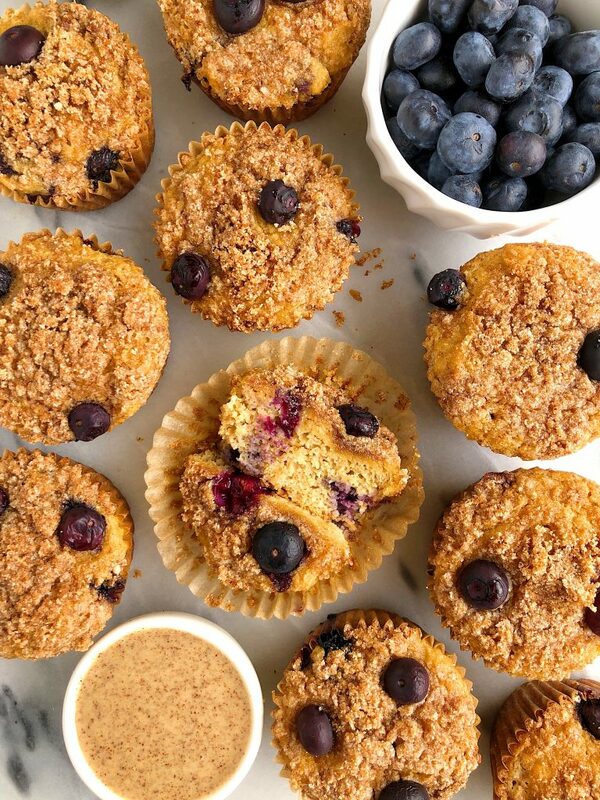 These muffins make for an easy breakfast on the go, snack or even dessert. I hope you guys love them as much as I do. And when you are craving even more muffins, here are a few of my favorites: Healthy Bakery Style Carrot Cake Muffins, Healthy Bakery Style Banana Muffins and my Dark Chocolate Chip Muffin Bread. *Store on counter in airtight container for a couple days, fridge for 5 days or freeze for a couple of months! Thank you Garden of Life for sponsoring this post! It means so much to me to partner with brands I love and believe in!